Tomorrow afternoon we are hosting a playoff party for the Wildcard week of the NFL. 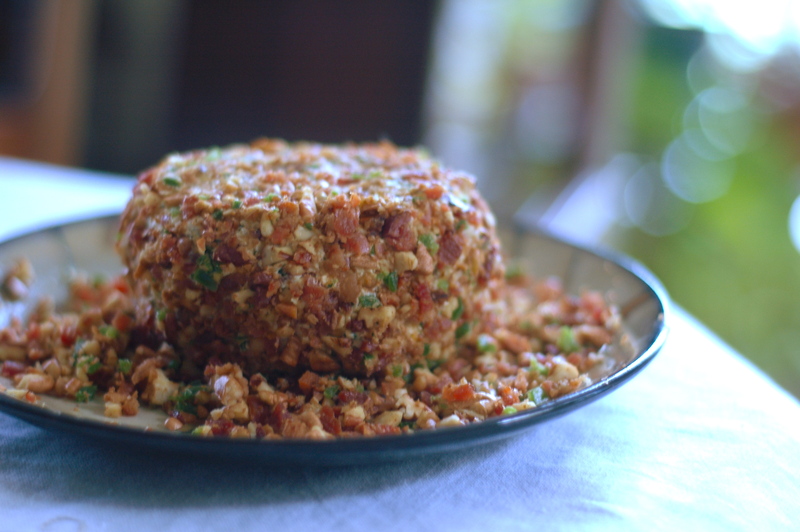 Unlike past parties where I rush anxiously around before hand preparing dishes, I wisely chose to host on a Sunday, giving me all day Saturday to casually make all the snacks necessary for a wonderful Football Brunch: a Bacon-Jalapeno Cheese Ball, Muhammara Dip, and homemade Chex Mix. The three recipes I made are all fantastic, and easy to make (30-45 minutes max) for those looking to expand beyond the classic Seven-Layered Dip or Hummus. Starting with the above picture, this dip is a recreation of the excellent recipe at Homesick Texan. It brings back all the flavors of my hometown, San Antonio, and has an uncanny resemblance to a Bean & Cheese Taco from Taco Cabana. For anyone who knows me, I am quite the B&C taco snob–no one outside South Texas seems to get the refried beans right. Now I know: it’s all about the bacon. Mix together the cream cheese, cheddar cheese, cilantro, garlic, cumin, cayenne, lime juice, Worcestershire sauce, half of the diced jalapeños and half of the crumbled cooked bacon. Taste and adjust seasonings and add salt. 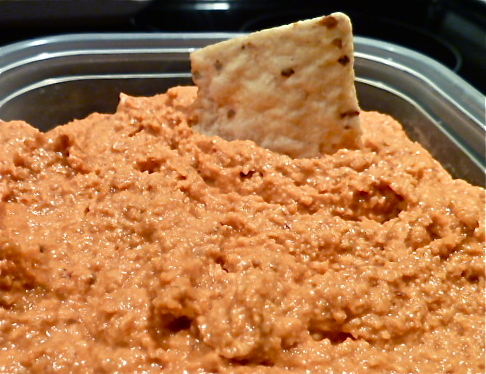 I’ve made Muhammara Dip before (one of my favorite recipes to come out of my Vegan Month) and it’s a great alternative to hummus with terrific flavors and textures. 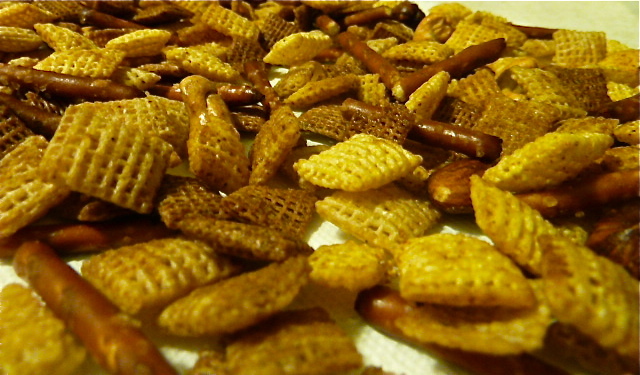 And for all you doubters who think buying Chex Mix is an easy way out, you clearly have never tried the homemade stuff. Baking it in the oven is key, and even without adding any additional spices to it (variations are endless), it’s so addicting and delicious it will easily become a party staple for you too. I was first introduced through Chris’ mom, and have adjusted the recipe only slightly by adding more butter (YUM). Heat oven to 250°F. In large bowl, mix cereals, nuts and pretzels and set aside. Melt butter and stir in seasonings. Gradually add to cereal mixture until evenly coated.